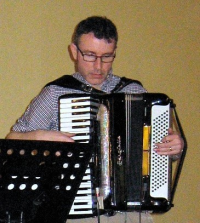 Jonathan is a truly versatile musician, and is equally at home on accordion, fiddle, piano or guitar. He is as comfortable playing classical violin in an orchestra as he is letting rip with some driving fiddle tunes for dancing, and can switch effortlessly between folk, classical, jazz and rock with an innate grasp of each genre's own idiomatic language. Public performance started early as an organist at his local parish church at the tender age of 11. While at music college he played fiddle and vocals for top Tamworth band The Soil Brothers playing "red hot rockin' countrybilly skiffle". This multi-tasking continued as he attended teacher training college by day and spent his evenings playing fiddle, accordion and backing vocals for the Bristol-based Irish band Midnight Brothers. Other forays have been as the piano player for a big band, playing keyboard in a jazz band and keyboardist/backing vocalist in a function band. He was the accordionist in a Bavarian oompah band and as if that wasn' enough he could also be seen regularly in the orchestra pit playing for theatre pantomimes. These days Jonathan is a violin teacher by day, but his folk credentials are still being maintained by way of his ceilidh band playing. 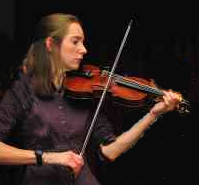 Victoria grew up playing Cumbrian and Lancastrian fiddle tunes and has played her fiddle in such far flung places as Glasgow, Aberystwyth and Cambridge before broadening her musical horizons when she crossed the Pennines to settle in Yorkshire. As well as tunes in the North-west tradition she cites her main musical influences as Jean Sibelius and Neil Young, and aspires to incorporate aspects of their sound into her distinctive fiddle playing, albeit with limited success. N.B. Contrary to what her name might suggest, Victoria does not know how to Morris dance. Maggie has been interested in all aspects of folk music since her involvement with her University Folk Club in the early seventies. She then moved to Harrogate in the mid-seventies and sang in many folk clubs in the area. Her interest in dance was established after visits to various festivals nationwide and she became a founder member of Betty Lupton's Ladle Laikers (a well respected Morris team of which she is still a member). In 1985 she was involved in starting a new ceilidh band in the Harrogate area. Since then she has called for many well-known bands including Fred Pigeon's Polka Band, Laycock's Overdrive, Old Chestnuts, Village Hop Band and the Dark Horse Ceilidh Band, amongst others! 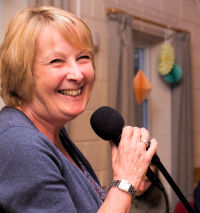 Maggie loves calling and particularly enjoys introducing new people to the fun and social interaction to be enjoyed at ceilidhs. 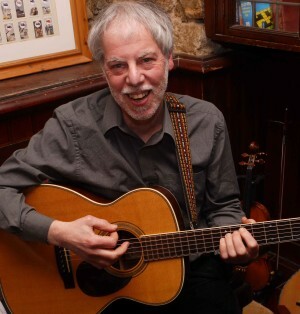 Ray has been involved in folk music all his adult life, beginning with visits to folk clubs in his native York while still at school. During the seventies he ran Harrogate Folk Club for several years, and again in the nineties he started another Harrogate folk club. This one had the unusual name of Friday 13th Folk Club and a quick Google search will explain why. He plays a variety of instruments including classical guitar and renaissance lute among others. By day, Ray teaches classical guitar and folk dance, but in the band he plays the more folky acoustic guitar and mandolin. His main role in the band is to provide rhythm but he usually sneaks in a wild tune or two on the mandolin between dances.